Virat Kohli with his 28th hundred ensured the final win was a commanding one. Just when the series looked done and dusted, Jason Holder’s Windies side sprung with a performance of high standards stunning the Indians in the fourth ODI to keep the series alive. Having failed twice in two matches all eyes were on Virat Kohli also to see if he would experiment with the playing XI. As expected, Virat and Team India went with the same line-up, which meant that Rishabh Pant had to wait a bit longer to make his debut in the 50-over format. Jason Holder won the toss and elected to bat first, on a batting friendly track at Sabina Park in Jamaica. 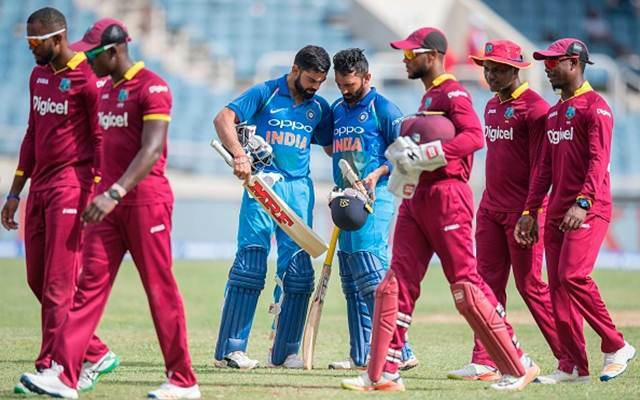 The Windies were off to the decent start, as they lost the first wicket in the ninth over of the innings, off the bowling of the Indian all-rounder Hardik Pandya. Elvin Lewis failed to get a proper connection on the ball, lobbing one straight to the hands of the Indian skipper. The Hope brothers show continued in the series, with both of them looking in some good form before Kyle Hope hit the ball straight to the hands of Shikhar Dhawan. At 76/2, the Windies were in a good position but just then Roston Chase failed to read the in-swinging delivery from Umesh Yadav the score read 76/3 within the space of two deliveries. Jason Mohammed and Shai Hope put up a partnership of 39 to stabilise things further before the former gave a simple return catch to the part-time bowler in the form of Kedar Jadhav. Windies’ skipper had a task in hand with his willow in the middle of the pitch with the score reading 115/4. Holder responded with free-flowing strokes in his knock of 36 in 31 balls before a good reflex catch from Shikhar Dhawan sent him back. Shai Hope, could not add more runs as Ajinkya Rahane took the best catch of the series to dismiss him. Rahane covered a lot of ground towards the swirling ball and made sure that he held the ball inches from the ground. Rovman Powell added another 31 from 32 balls before the innings came crashing down at 205 at the end of the 50 overs. India did not get off to the best of starts, with southpaw Shikhar Dhawan hitting one straight to the hands of Elvin Lewis off the bowling of Alzarri Joseph. Opening batsman Ajinkya Rahane and Virat Kohli ensured that there were no hiccups in this particular chase, with a partnership of 79 runs before Rahane was caught in front off the bowling of Devendra Bishoo. Rahane, through his knock, ensured that he was the highest run-maker in a Windies series, with 336 runs in the series beating the gracious VVS Laxman, who scored 312 runs in the 2002 series. Dinesh Karthik then joined the skipper, with latter looking in some sumptuous form while the former was knocking the ball ever-so-aggressively. At no point in the innings, the duo let the bowlers dictate terms, Windies bowlers on their part never looked like picking up a wicket either. Virat with yet another successful chase became the player with most number of hundreds in a run-chase surpassing Sachin Tendulkar with 18 hundred as he recorded his 28th in Test cricket. It's been 11 years (May 2006) since India lost an ODI series in the Caribbean. Virat Kohli gets the trophy and hands it over to Kuldeep Yadav. West Indies is Such a Beautiful Country, Thanks BCCI for Organising this Awesome Tour. Kohli's ODI career is less than 9 years old and he already has 28 centuries. 18 of them while chasing. Sachin in 22 yrs scored 17 in chases. Virat Kohli is just 2 ODI centuries behind Ricky Ponting and has played just half of what Ponting has. UNREAL.